“Part of my W2 lesson…is about becoming an ‘Ambassador for the Kingdom of Witchdom’ and by perfect example, I give you Irma Hackett,” says Karen Ainsworth a student that Irma is mentoring. 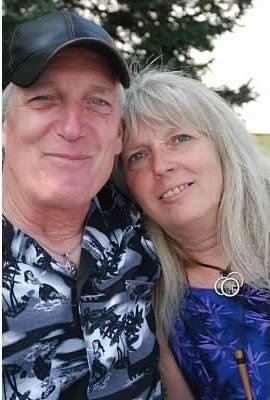 I live in the mid-coast area of Maine with my husband, Bob, we’ve been married for 38 years. Together we run Ancient Star Herbals/C&C (Corvid & Canid) Forge along with our son Joe. In my heart I have always followed the way of the witch, but it has only been the last 8 years that I’ve sought formal study along with Bob. The last 5 of those both of us have been students in the TOW Mystery School. We are both looking forward to graduating Witchcraft V soon. My practice tends to follow that of a Shamanic Witch, as I’m at my happiest working in nature amongst the plants and animals. I find I am most at peace when I either have my hands in the Earth or walking barefoot in the gardens or woods. I’m a Reiki Master in both Usui and Shamballa Reiki. I also have been certified in level 1 of the Bach Flower Essence Program. Together Bob and I teach classes and present workshops locally on Witchcraft, Plant Magick, ritual tools and a variety of other Magick related subjects. I’ve been a mentor with the Temple Mystery School for three years. I’m also currently serving as a teacher/mentor for a local group here in Maine. I try to remain objective and keep an open mind. I try to set aside my own personal views because this allows me to push a little further and go a little deeper. I also realize the person I’m mentoring affords me an opportunity to see each lesson from a new perspective, which has given me a better understanding of how the student can become the teacher. I also see being a mentor as an excellent way to give back to the Temple and the Mystery School, two organizations that have given me so much. The biggest indicator is being able to readily see the personal and spiritual evolution of the person I’m mentoring. When you help someone you begin to see them blossom through the application of shared wisdom. It’s a true blessing to know you had a part in this. Go into it with an open mind, with no preconceived notions. Be receptive and willing to learn as much if not more from your student as they will from you. I see the students I mentor as peers and am constantly amazed at their ability to shine a new light on my own lessons and studies. I find the mentoring program to be one of the many hidden blessings the Mystery School has brought into my life.